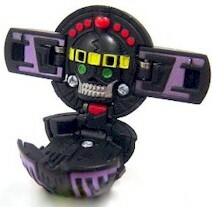 El Condor is a shaman-like Bakugan in a mysterious totem shape. It has amazing ability to fly, soaring like a giant Condor over its opponents in battle. El Condor can neutralize its enemies with a dazzling green laser beam. El Condor was released in all Attributes, except Pyrus. A Haos El Condor is worth between $5.00 and $10.00. A Clear El Condor with 500 Gs is worth between $10.00 and $14.00. Now in Gundalian Invaders any El Condor is probably worth $10.00 to $15.00. An Aquos El Condor has 510 Gs and Haos El Condor has 580 Gs. Purchase El Condor from Amazon now!